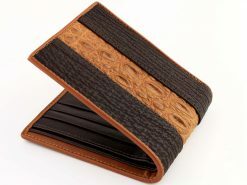 These mens designer wallets are fashioned from genuine croc skin and have proven to be hugely popular. We’re designing these using some of the tough hornback as well as highly textured flank of this noble beast. We’ve also matched this with a cream color calfskin interior. A great unisex wallet for any fashion style and sure to separate the hot from the not. Match it with anything in the wardrobe from denim jeans to formal garb. Finished in bone white highlighting the natural patterning, get this croc leather wallet to and stand apart from the rest.